In the 1920s, rail travel seemed like a king that would never be deposed. Traveling by rail provided an inexpensive, relatively safe and reliable form of transportation. The basic design of trains hasn’t undergone many major changes over the years, but there have been plenty of proposed overhauls and innovations of the railway system all over the world. 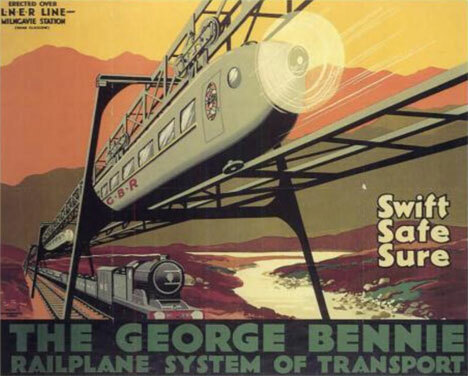 One of the most creative was the Bennie Railplane, a propeller-powered overhead train system created by Scottish engineer George Bennie. The idea behind the railplane was to create a passenger travel system that wouldn’t be slowed down by sluggish freight trains. Bennie’s Railplane could travel at speeds up to 120 MPH thanks to the the propeller on each end, both driven by their own electric motor. The idea went far enough that a test track was constructed near Glasgow in the 1930s. The 120-meter line had a track below and a track above, rather than the traditional two tracks below that other trains use. 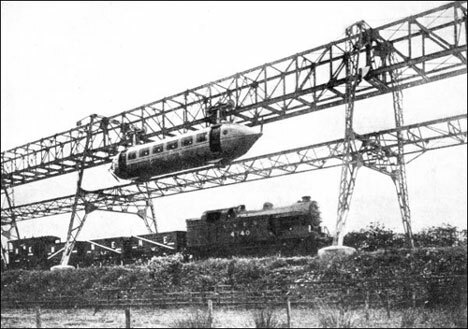 The highly unusual railplane was to run directly above conventional rail lines, so it wouldn’t take up any additional ground space other than that already occupied by existing railroad tracks. Plans for the strange rail system included a line running from London to Paris, with a seaplane in the middle to carry passengers across the English Channel. Bennie received support and interest from all around the world, but was never able to secure adequate funding for his revolutionary concept. The railplane idea may have been solid mechanically, but it happened to come around at a terribly time financially. When the world economy collapsed in the 1930s the idea was scrapped. The test track and only prototype ever built followed suit in the 1950s when they were sold for scrap. See more in Epic Failures or under Vintage & Retro. August, 2010.